The PCI2S232485I PCI Serial Adapter Card lets you turn a PCI or PCI-X slot into 2 serial ports capable of communicating in RS-232, RS-422, or RS-485.This universal, all-in-one adapter not only features two DB9 serial ports that can be independently configured, but also supports nearly any configuration: RS-422, RS-485 2-wire, RS-485 4-wire, or RS-232 operating modes. 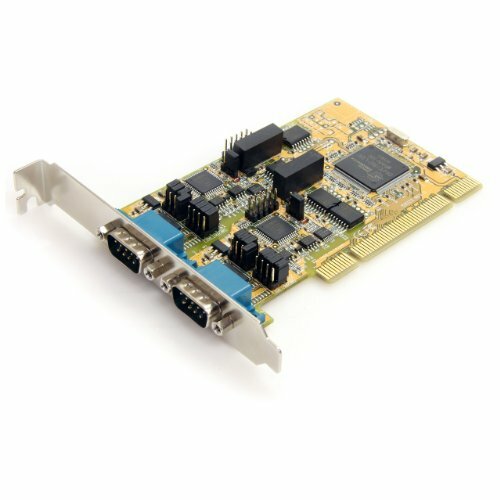 Designed for reliability, this 2-port PCI Serial card also features built-in ESD (Electro-Static Discharge) protection to ensure that connected serial devices remain protected. Compatible with a broad range of operating systems, including Windows 2000/XP/Server 2003/Vista/7/Server 2008 and Linux, as well as a number of Embedded operating systems like Windows XP Embedded, POS Ready 2009, CE 4.x/ CE 5.0, the PCI2S232485I is backed by our lifetime warranty and free, lifetime technical support.